I’ve come to realise that C.L Taylor’s books are dramatic and can sometimes a little unbelievable but do you know something? I’m totally okay with that. 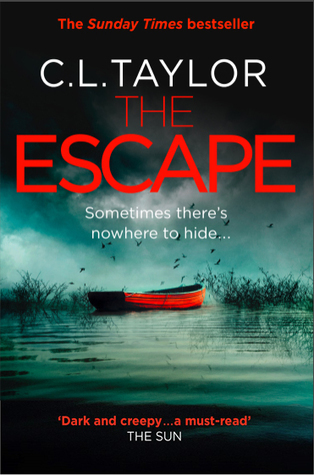 This is the fifth book I’ve read by C.L Taylor and I can confirm that I’m quite a fan of her writing! Jo isn’t the easiest character to like. I don’t know what it was about her really, but I was desperate for her to have a little more fight in her. However, I still found myself wanting things to turn out well for her. I found her husband a little infuriating too, but this didn’t affect my enjoyment of the story. There’s something about this author’s writing that I find totally compelling. C.L Taylor sure has a way of keeping you turning the pages. Her characters are well fleshed out and totally believable, even if sometimes the situations may seem a little exaggerated- it still seems like these could be real people! I may not have thought much of these characters, but the story kept me turning the pages! She writes incredible page-turners! I enjoy her books a lot! Ah thank you! I don’t know why that is. How odd! There was a bit of a glitch last week. For some it seems to have been fixed but for others, like yourself, not. Is it still showing in your settings? I don’t know how to look at that. I can see that. It’s not bothering me too much, but I can see why you’d have some trouble with it! Great review! Good to hear the story makes up for the characters… I’m not sure how I would react to the credibility of it all though. I know! I can understand that. 🙂 Nothing wrong with some drama!